Is Duke Energy Corporation (DUK) A Good Stock To Buy? Although the masses and most of the financial media blame hedge funds for their exorbitant fee structure and disappointing performance, these investors have proved to have great stock picking abilities over the years (that’s why their assets under management continue to swell). We believe hedge fund sentiment should serve as a crucial tool of an individual investor’s stock selection process, as it may offer great insights of how the brightest minds of the finance industry feel about specific stocks. After all, these people have access to smartest analysts and expensive data/information sources that individual investors can’t match. So should one consider investing in Duke Energy Corporation (NYSE:DUK)? The smart money sentiment can provide an answer to this question. Hedge fund interest in Duke Energy Corporation (NYSE:DUK) shares was flat at the end of last quarter. This is usually a negative indicator. The level and the change in hedge fund popularity aren’t the only variables you need to analyze to decipher hedge funds’ perspectives. A stock may witness a boost in popularity but it may still be less popular than similarly priced stocks. That’s why at the end of this article we will examine companies such as Sony Corporation (NYSE:SNE), The Bank of Nova Scotia (NYSE:BNS), and Becton, Dickinson and Company (NYSE:BDX) to gather more data points. Let’s analyze the latest hedge fund action surrounding Duke Energy Corporation (NYSE:DUK). At the end of the fourth quarter, a total of 17 of the hedge funds tracked by Insider Monkey were long this stock, a change of 0% from the second quarter of 2018. Below, you can check out the change in hedge fund sentiment towards DUK over the last 14 quarters. With hedgies’ capital changing hands, there exists an “upper tier” of key hedge fund managers who were increasing their stakes considerably (or already accumulated large positions). More specifically, Renaissance Technologies was the largest shareholder of Duke Energy Corporation (NYSE:DUK), with a stake worth $708.5 million reported as of the end of September. Trailing Renaissance Technologies was Zimmer Partners, which amassed a stake valued at $79.5 million. 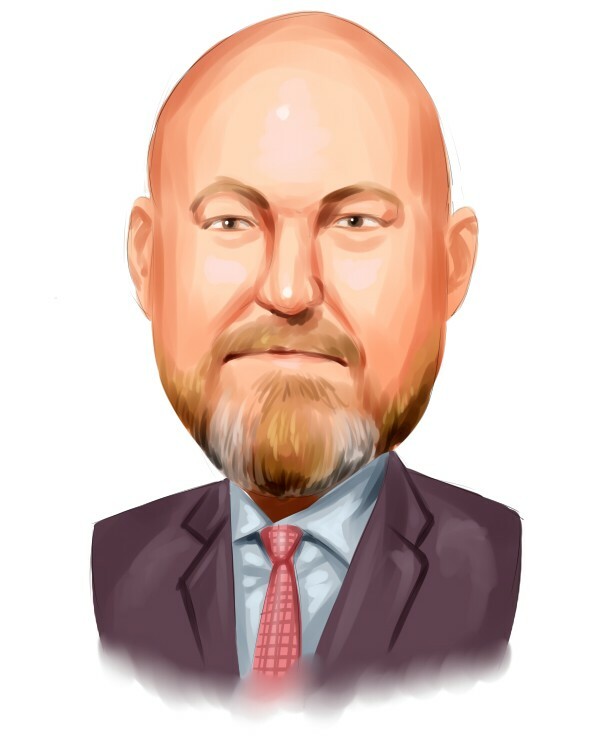 Citadel Investment Group, AQR Capital Management, and GLG Partners were also very fond of the stock, giving the stock large weights in their portfolios. Since Duke Energy Corporation (NYSE:DUK) has faced a decline in interest from hedge fund managers, it’s safe to say that there is a sect of hedge funds that elected to cut their entire stakes by the end of the third quarter. Interestingly, Jonathan Barrett and Paul Segal’s Luminus Management cut the largest position of all the hedgies tracked by Insider Monkey, comprising about $137.3 million in stock. Israel Englander’s fund, Millennium Management, also dumped its stock, about $57.7 million worth. These transactions are interesting, as aggregate hedge fund interest stayed the same (this is a bearish signal in our experience). Let’s also examine hedge fund activity in other stocks – not necessarily in the same industry as Duke Energy Corporation (NYSE:DUK) but similarly valued. These stocks are Sony Corporation (NYSE:SNE), The Bank of Nova Scotia (NYSE:BNS), Becton, Dickinson and Company (NYSE:BDX), and Biogen Inc. (NASDAQ:BIIB). This group of stocks’ market caps are similar to DUK’s market cap. As you can see these stocks had an average of 33.25 hedge funds with bullish positions and the average amount invested in these stocks was $1363 million. That figure was $868 million in DUK’s case. Biogen Inc. (NASDAQ:BIIB) is the most popular stock in this table. On the other hand The Bank of Nova Scotia (NYSE:BNS) is the least popular one with only 14 bullish hedge fund positions. Duke Energy Corporation (NYSE:DUK) is not the least popular stock in this group but hedge fund interest is still below average. This is a slightly negative signal and we’d rather spend our time researching stocks that hedge funds are piling on. Our calculations showed that top 15 most popular stocks among hedge funds returned 19.7% through March 15th and outperformed the S&P 500 ETF (SPY) by 6.6 percentage points. Unfortunately DUK wasn’t in this group. 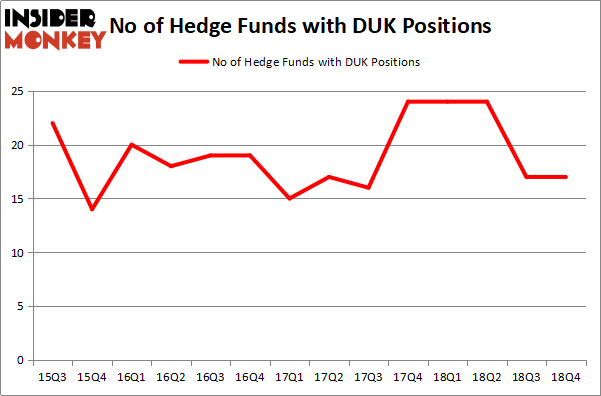 Hedge funds that bet on DUK were disappointed as the stock returned 6.0% and underperformed the market. If you are interested in investing in large cap stocks, you should check out the top 15 hedge fund stocks as 13 of these outperformed the market.